This picture has a swansong theme: it shows the last GP the works Cooper team took part in. Ever since breaking ground for the nimble rear-engined GP car in the late fifties, dominating the 1959 and 1960 seasons with Jack Brabham, Cooper Car Co. had been on the decline. With Brabham leaving the Cooper brothers never got to grips with the new 1.5-litre formula, the team excluding new team leader Bruce McLaren from involvement in the design department. After the death of Charles Cooper and McLaren's departure the company was sold to the Chipstead Group, the Maserati UK dealers, providing the race team with 3-litre Maserati power. The 1966 and 1967 seasons only brought limited success, courtesy of the bulky T81 and T86, which even its talented customer users like Siffert and Bonnier couldn't get to work. A switch to BRM power for the following season, paired with an updated T86B design, promised little improvement since Cooper was unable to attract any star drivers for its 1968 campaign, while the car itself wasn't particularly good as well. Its second-rate driving crew, consisting of sportscar regular Vic Elford and co-owner Lucien Bianchi, spent most of the season at the back of the grid, destroying Cooper's last bit of good reputation. There were points, notably at Monaco where Bianchi and guest driver Ludovico Scarfiotti finished 3rd and 4th, but they were a mighty four laps down in a race of exceptional attrition. And so it became obvious that the once allmighty Cooper factory had outlived its glory days. A truly dismal showing in Mexico, where Bianchi lined up last on the grid, with Elford doing marginally better, signed the team's death certificate, the team folding in 1969. Thus, the Alfa-powered Cooper T86C prototype and the unfinished T91-DFV never raced. 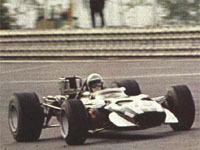 Curiously, Elford carried on with Colin Crabbe into the 1969 season, using the T86B chassis, this time fitted with the outdated Maserati engine again, under the rather telling name of Antique Automobiles… It may come as no surprise that Elford finished 7th and dead-last in the Monaco GP, a whopping six laps down, a disappointment leading him to can the tub after this single showing and replace it with a more up-to-date McLaren M7A, with an all-conquering Cosworth in the back. To no-one's surprise the 1969 Monaco GP was also the last time the once glorious Maserati name appeared on the entry sheets.